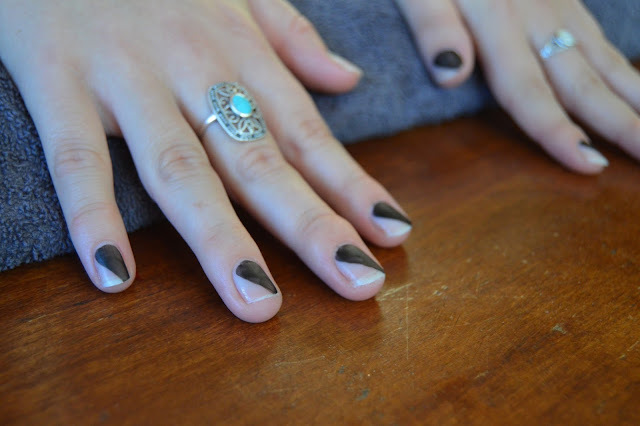 I'm fairly sure that the only downside to working in a bakery is not being able to paint my nails - however, as I generally have five days off in a row there's still plenty of time to have fun with them, and this tutorial is certainly good fun! I first met Charlotte, also known as Dotty Designs at the Norwich Makers Market back in September where she gave me an amazing pink and blue dotty manicure that easily lasted ten days! We chatted for ages while she worked her magic, and decided then that working on a tutorial together would be perfect! 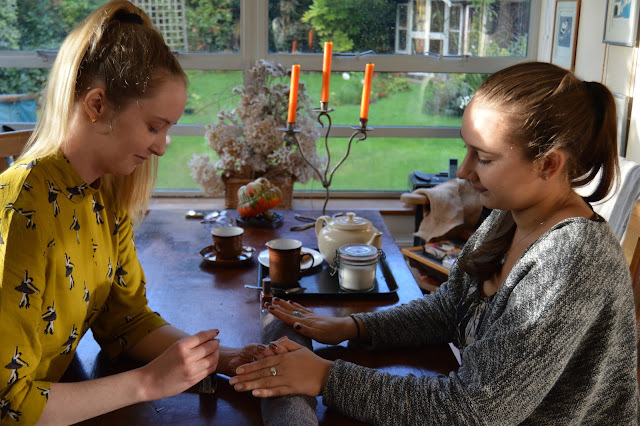 Charlotte (on the left) has been painting nails since she was just ten, meaning she's now been at it over 14 years! 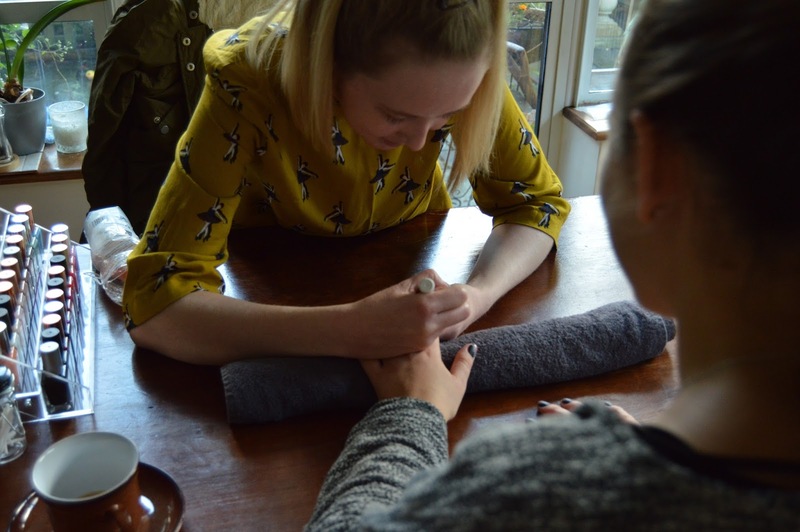 When she wasn't enjoying high school, she started experimenting with nail designs on a Sunday evening to bolster her confidence for the week ahead. Fast forward a few years, and Charlotte graduated from university with a degree in Ecology that just didn't feel right. 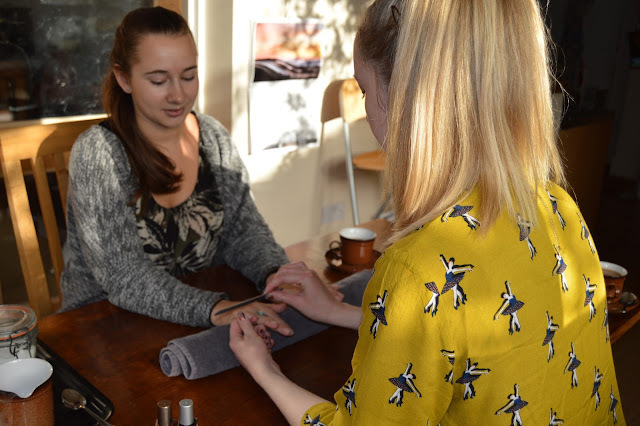 Rather than search for something that did feel right, Charlotte decided to concentrate on the thing she'd always been good at and had a passion for - fun and beautiful nails! Charlotte has been kind enough to share a few of her secrets, and we've worked together on a lovely Autumnal (even a little Halloween-esq) tutorial which should be really easy to recreate at home! We decided on this fantastic metallic copper (I am seriously copper obsessed at the moment!) and also a matte black. I've never been completely convinced by matte nail polish as I couldn't help but imagine it would feel like a chalkboard. 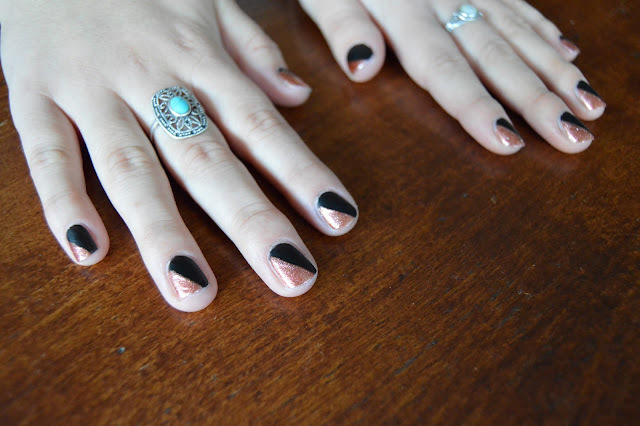 Putting a chalk board on your nails just seemed like a disaster, but this totally has me convinced! Using the colour you've chosen to go closest to the base of your nail (we chose the black) paint a diagonal stipe approximately half way across the nail. Use the brush to fill in the area between this line and your cuticle. It will need two coats so don't worry too much about it being patchy. Paint each nail in the same way. Give this first coat a minute or two to dry, then paint each nail a second time to give an opaque finish. Using the second colour (copper in our case!) Fill in the other half of each nail. You're aiming for a nice clean line down the centre, but the dots will disguise any small mistakes so don't worry too much. As with the black, wait a few moments for the first coat to dry then paint each nail again. 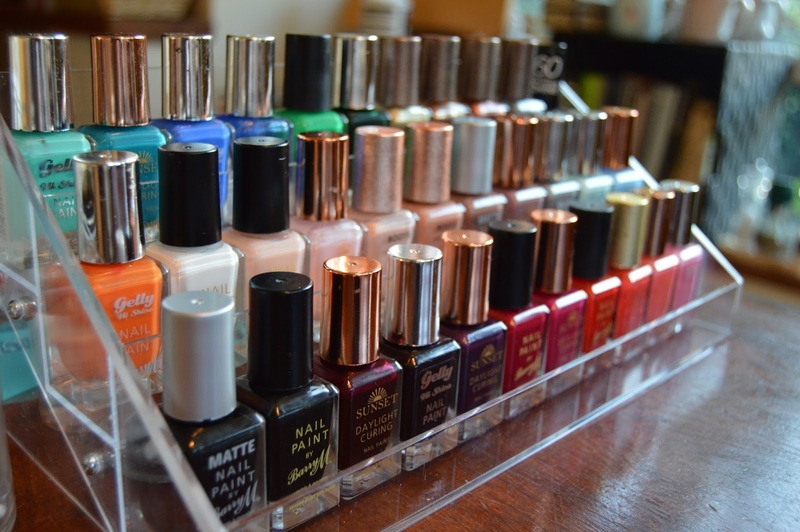 Barry M polishes only need two coats but if your colours still look a little translucent you may need three. 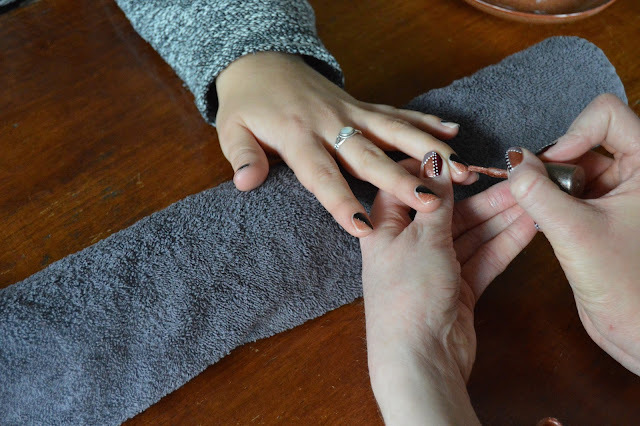 This next part uses Charlotte's favourite nail art pens. They come in several colours, but for this we went for the white. Press the nib of the pen down onto a tissue or cotton pad to get the paint flowing, then dot onto the nail, following the line where the two colours meet. You could leave it here, but we decided to add a row of dots either side of the central row too. Try to keep the dots evenly spaced, and go slowly! 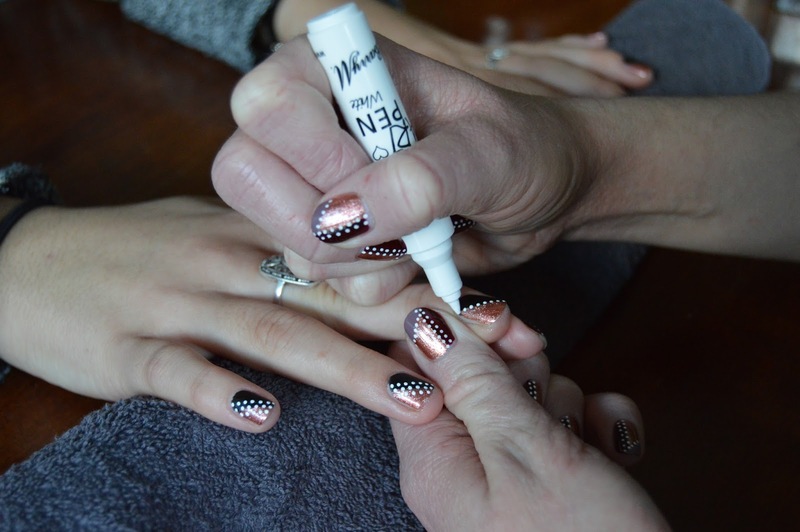 Leave the dots plenty of time to dry so your top coat doesn't drag the colour and make your design blur. 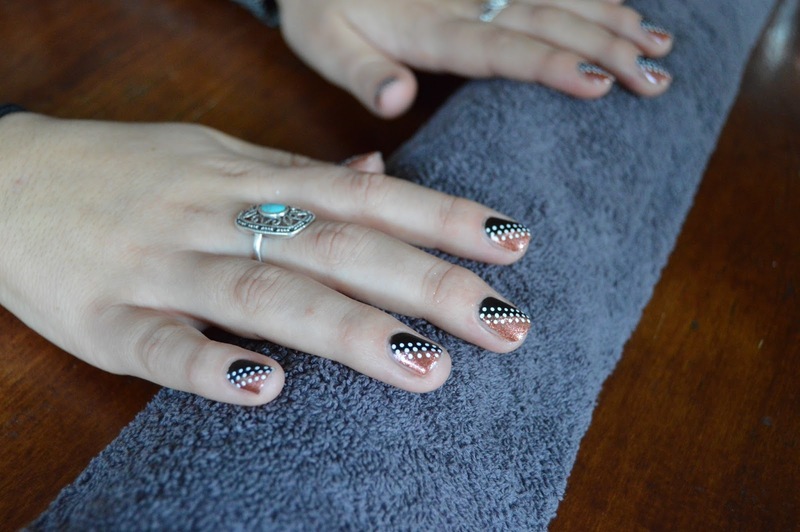 We chose a matte top coat to go with the matte black polish and Charlotte gave each nail a coat to seal in the dots and make the design last longer. Alternatively, if you're local and would like to have Charlotte work her magic she is available for private appointments, weddings, hen parties, pamper parties and children's parties and craft fairs. Get in touch at dotty.designs@hotmail.com or follow her on Instagram and Facebook for more stunning designs.